What a perfect harvest dish! Wonderful flavours. Thanks Hannah. I've pinned it. My pleasure, Aunt B - I hope you enjoy it! I love it, I thought the skillet souffle was a wonderful idea, I have been on a concord grape kick lately, making jar after jar of jam and grape soda also. Beautiful! Thank you, Suzanne! Your grape jam is wonderful, and I love your suggestion of grape soda. My boys would certainly enjoy that! Cooked grapes are new to me, but it seems like I've been seeing them around lately! Fallen or not, this souffle looks great! Thank you, Christina! New to me, too - I highly recommend roasting or cooking with grapes in some way. Now I'm thinking about fall dishes I can pop them into. 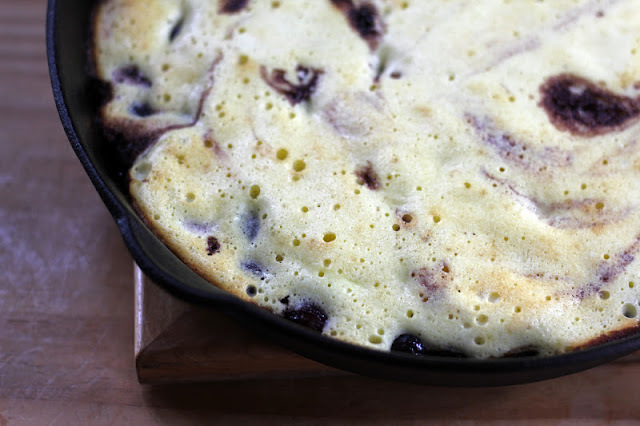 I had the same issues with my skillet souffle this month but flat or not, this one sounds fantastic! I'm such a fan of balsamic anything and I can't say I've ever had balsamic grapes. I will definitely have to give that a try and over pancakes sounds amazing! Thank you, Kate! Ahh, fallen souffles...good to know I'm not alone. :) I'm popping over now to read more about yours - it looks beautiful! I have never eaten a souffle of any kind. This looks like a great place to start! I think you'd like souffle, Brooke - I hope you have a chance to try it. Elevates cheese and eggs to a whole new level...or go for a chocolate one! My pleasure, Ruth! 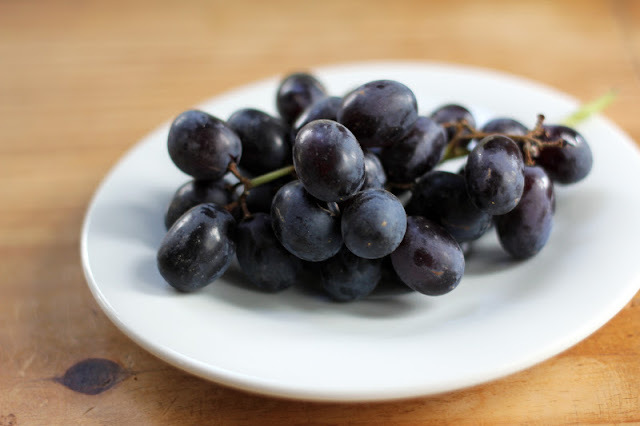 I'm noticing more recipes now for roasting/cooking grapes, so I'm excited to give them a try. I'm roasting some with shallots, thyme and garlic for tonite's dinner...they are smelling divine. What a great idea - I have roasted grapes with chicken and wow - what an amazing flavor they take on after heat is added. This must have quite a dramatic flavor with balsamic. Who cares about the height - no prejudice from me, a short person, about a short souffle :-) Cheers! I'm making the chicken/grape recipe you recommended for dinner tonite, Beth - can't wait! Thanks again for sharing it. A souffle in a skillet--that's a cool concept! Making a souffle has been on my to do list for a long, long time. 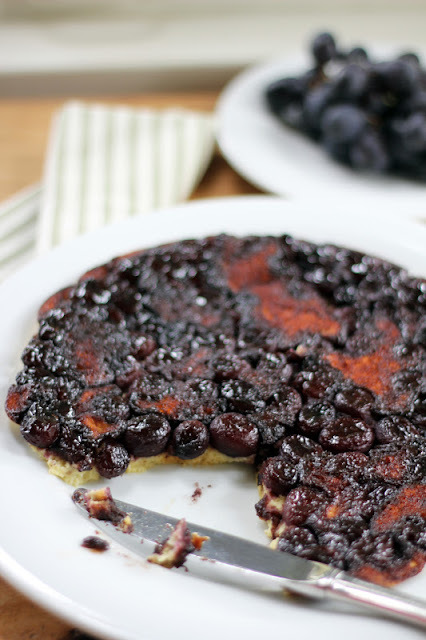 And blueberries + balsamic over pancakes sounds awesome. My birthday isn't until next June, though...I don't think I can wait that long to try that combination! I would never have thought to make a souffle in a skillet if it wasn't for Abby's recipe - love it, though, and I'll do it again. I'm finding I love anything made in a skillet! Isaac's birthday isn't until spring. I don't know if he'll wait that long either to try the pancakes! How creative! And gorgeous. 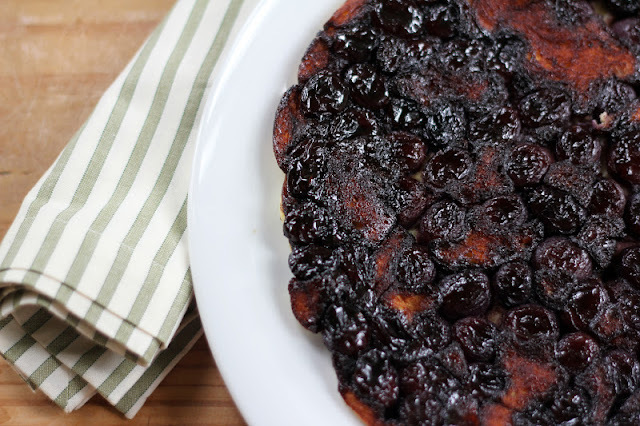 Thank you for sharing such a lovely recipe - pancake or souffle, doesn't matter to me. :) Hm. I'll have to look for some unfiltered grape juice. Sounds incredible. Thank you, Jenni! I found the unfiltered grape juice at Trader Joe's - the grapes are even from Yakima. Local and delicious. I love it! This looks amazing. I never would think to make a souffle like this. I love grapes and this seems lik such a cool use of them. I recently roasted grapes for the first time and love the taste of them cooked! I wouldn't have thought of this either, Beth, if it wasn't for Abby's recipe challenge. Amazing how the flavor transforms when the grapes are cooked. I am roasting chicken right now with grapes, shallots, garlic and thyme for dinner. I'm delighted to discover this new world of grapes! This looks fantastic. It reminds me of a tarte tatin but as a souffle. And the balsamic grapes are gorgeous. Thank you, Lynda! You're right, it is rather tarte tatin-like, which reminds me that I still want to make your apple one with the sour cream pastry. I'm hooked on the balsamic grapes and thinking of new ways to incorporate them in other recipes now. What a wonderful combination of flavors! I've got to try this. I made this last night & it was a big hit! Thanks for your wonderful recipes.